around part (92) now works correctly with slabs. In Concrete console (110), the column is now not fit horizontally when you leave the column height value empty and select the last list option to modify the shape of a sloped secondary beam. In Embedded anchors (8), you can now create the thickening part as a composite of 3 beams, defined by a polygon. with a large opening in the center area of the slab, the minimum width of the neck on both sides of the slab is now checked no matter what end option (skewed / straight ) is selected. Earlier, the minimum width was not checked when both slab ends were set to skewed, with no need to check the end angles. point was overridden if the Ortho tool was in use. , and the cast unit contains another concrete part near the original input part, these additional parts will also be cut. Note that Wall to wall connection and Wall groove seam detail are not updated automatically whenever other parts are added, removed or modified in the cast unit. You need to trigger the update by modifying the components manually. In Rectangular column reinforcement (83), when creating cranked rebars, you can now define the length separately for the side bars and corner bars on the Bar ends tab. layout on the UDA tab, Wall layout swapper now swaps the Back / Front values of the swapped wall parts. Otherwise, the value Back is set for all wall parts, as before. (84), you can now select the creation orientation of the electric box. stair (95), you can now create rebar shape 64 on the Bar C and Bar E tabs. stair (95), the radius value for the bottom end and top end rebars is now applied correctly on the Landings end bars tab. stair (95), you can now define hooks for rebars on the Bar B tab. stair (95), there are now new rebar end condition options on the Bar C tab. attributes tab for cutting the meshes. Grouting can be used when connecting parts with anchor bolts or rods, or in seams between panels, for example. Grout is flowing concrete that hardens after application. , insulation, or other parts attached to the hollow core slabs. stair (95), horizontal ridges are now cut in the corner by a vertical line determined by the vertical ridge slope. stair (95), the stirrups and the pin bar on the Bar E tab are now created with enough of cover thickness. Also, the side of the endings of the stirrups on the Bar E tab have been turned around. stair (95), you can now define extra side bars and their end conditions on the Bar C tab. array (91), there is now a new option, Mesh spacing type, on the Picture tab. You can now set the spacing type to Exact number. Use Exact number when the mesh has a specified number of spacings, like 1*100, in mesh_database.inp. window, cuts are now created correctly in the corners. layout has been changed so that seams crossing the openings now split the wall panels into two separate panels or cast units. reinforcement (77), rebars are now properly adjacent to their perpendicular neighbor rebars. around part (92), you can now define the cut offset from the edge of the cut part. (1065), the vertical offset of the gusset is now correctly applied when creating the gusset to the above or below position.
. Previously, the bottom flange could not be closer to the main part than the top flange or web. In Tube splice (6), you can now control the creation of cuts in the end plates. (1004), when using U shape anchor rods and hook direction of type 3 or type 4, the created parts are now correctly attached to the anchor rod. (20), the bolt type for brace bolts 1-3 now works correctly. welds now get the same default values. option is set on the Parts tab. simple (146), you can now define separate profiles for the top and the bottom angles on the Angle box tab. (141), the slotted holes for the top and bottom primary bolts in the angle box are now correctly applied. and stiffener assembly prefixes and start numbers. , material and name of stiffeners are now correctly applied. In 2L Splice (152), the primary bolts are now created to the correct positions for both beams. tolerance on the Parts tab. In Welded tee (32), you can now define the bottom edge distance of bolts. In Joining plates (14), bolts are now created correctly for larger gaps between end plates. connection 2 (73), both stabilizer welds are now created vertically. (20), Wraparound gusset (58), Hollow brace wraparound gusset (59) and Gusseted cross (62), you can now control slotted holes independently for brace bolts on the gusset side and the brace side. of the connection plate are not defined, the component now uses the setting from File menu > Settings > Options > Components. flanges are now correctly applied as defined on the Beam cut tab. In Rectangle to circle (17), when creating four cuts on objects that are not centered, the cuts are now created correctly. In Bolted moment connection (134), the flange plates are no longer offset vertically when wider than the column. In U.S. Hip & Valley (179), the bolt horizontal edge distances are now correctly applied on the bolts. (104) now works correctly for rectangular profiles. when using the Battledore connection type. is now correctly positioned for sloped secondary parts. (27) now works in the same way for C profiles as for U profiles. plates on the new Shim plates tab. manager again. This has now been fixed. , the performance of the Copy value and Paste value commands has been improved. Export now checks the Set Top in Form Face setting for all parts, if in use. , name or material with the new setting Exclude embeds by. When you export cutout data with the option Full depth cuts only, now the actual full depth cut geometry is exported without recesses. In Net area calculation, you can select whether the export excludes all cuts or only full depth cuts from the net area calculation. The whole assembly is checked. In Weight calculation, you can select which weight will be exported. In Decimal mark, you can set period (.) or comma (.) as the decimal mark. In No. of digits after decimal point, you can now set 3 digits after the decimal separator. The default value is 1 digit. Now this option also affects volume, gross area and net area. Reinforcement tab: You can now export spacer start position and spacer pitch information with the new settings Spacer start position and Spacer pitch. bars. When you select Yes, information about welded leg designation is exported. HEADER block data specification tab: It is now possible to specify building site and building owner name, address, post code and city/town. When you used rotation in export, the line attribute override did not take rotation in to account. This has now been fixed. Pile may be made of precast or cast-in-place concrete, or steel. level number in part user-defined attributes dialog box on the Unitechnik tab. If there are elements in the stack which need to be layered on the same level, then the pile level is used. Tekla Structures sometimes crashed when you inserted a certain shape. This has now been fixed. Drawing font definitions created by DWG Export were not understood by some programs. Now the definitions have been fixed. instance failed after you had deleted the reference model from a single user model. This has now been fixed, and the single user data storage is also cleaned. 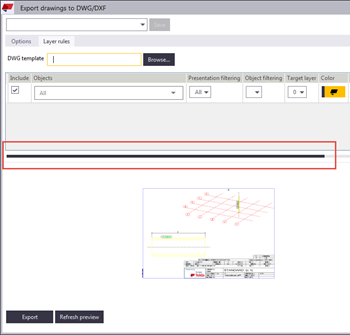 Previously, when you minimized the new Export drawings to DWG/DXF dialog box, it was sometimes difficult to reopen it. Now it is easier to reopen it, because there is a separate icon for the drawing export on the taskbar. The image files are now named correctly in Export Drawings. The Export drawings to DWG/DXF window now has a scroll bar if the window is minimized enough. The BVBS export no longer stops when some reinforcement has invalid geometry. When this happens, the invalid reinforcement is ignored in the export, and an error message with object id is shown in the log. HMS Export now exports pull forces for strands. pictures in rotated templates are now drawn better. The command Arrange drawing objects (Freeplace) > Ignore current locations now also moves rebar mark base points to the original location. properties to dimension lines associated to pour objects in GA drawings. Note that dimension tags created on pour objects before this fix will not work with the new tag, and they need to be re-created. In addition to the selected area, selection switches and selection filters control which object types are selected. works correctly again in drawings. Cloning drawings from other models did not work. Now this has been fixed, and cloned drawings are created successfully. dimensioning now shows the radius dimension using correct positioning attributes. Separate row definitions were no longer considered to be part of separate tables. This has now been fixed, and rows using columns are now handled as before, so all rows using columns belong to the same table. Previously, when adding marks to several parts in a drawing, and one of the parts already had a mark and the rest did not have mark content defined, nothing happened. Now the mark properties dialog box is displayed where you can define the contents for the marks. The advanced option XS_USE_RECESS_SYMBOL_FOR_BORDER_AND_CORNER_RECESSES did not work correctly. This has now been fixed. Changes in layout editing in Tekla Structures 2017 SP3 have caused slower template update in some cases, and opening of drawings was slower. This has now been fixed, and drawings are opening faster again. In the layout editor, it is possible select which tables are included in the table layout and where they are placed. The table scale, and rotation and overlapping with drawing views can be adjusted. in US Imperial environment has been increased. Layout editor now also displays the drawing frame to which the templates are anchored. This is best visible in US Imperial environment where this frame is not at the same location as the blue frame of the drawing. filters did not work after the columns Ready for issuing and Ready for issuing by were added. Now they work as they used to. Drawing snapshots make it possible to have a quick look at any drawing without opening the drawing. Snapshots are used, for example, for finding a certain drawing edition. Snapshots can be viewed in Tekla Structures but they cannot be edited. on top of the model. This has now been fixed. in drawings to be used especially in section views. This option shows different representation for parallel and perpendicular bars. When selecting a row in the view creation and view dimensioning panels, values that differ only on the character case from the corresponding one are no longer lost, for example "cu_front_formwork" properly matches the "CU_Front_formwork" attribute name. Earlier, manually added welds were jumping because insertion points and moving points were different due to protection settings. Now the behavior has changed, and the first and last inserting points match moving points. Drawings react to modifications in the model and are updated accordingly. Tekla Structures includes the following types of drawings: single-part drawings, assembly drawings, cast unit drawings, general arrangement drawings, and multidrawings. Tekla Structures creates drawings using the drawing properties defined for each type of a drawing. Every drawing is made up of a drawing layout and drawing views. lines are rotated to align with the grid lines. , the Read in and Write out buttons on the Quick Access Toolbar and some of the sharing commands in File > Sharing were shown as dimmed. This has now been fixed. , if the model is not saved correctly at write out, Tekla Structures now shows an error message advising the user to rejoin the model. Previously, shared models that contained rebar sets could cause Tekla Structures to crash or to function incorrectly. This has now been fixed. , the packet number is now correctly updated when a remote user writes out a packet while there are already some packets pending for read in. Forming the union of the shapes now works better when more than two objects/shapes are selected. Calculating the start/end of the guide line now works better with multiple objects, or when the solid shape varies along the rebar range. In addition, it is now possible to select multiple objects when the selected faces are on the same plane. CC_EXACT now outputs the number of spaces. Previously, it output the number of rebars. In Automatic splicing tool, the list of Splice symmetry options now has an option that mirrors the first symmetry option in the list. Measuring bolt spacing does not cause Tekla Structures to crash anymore. Only one incompatible load group can exist in a given load combination. are now blue and better visible on the gray background than the previous yellow points. When you open a model created with an older Tekla Structures version in a newer Tekla Structures version, autosave is not done until after you have first normally saved the model. This is because previously if you loaded autosave when opening a model, Tekla Structures did not work correctly and data could be lost. When you open a model created with Tekla Structures 2016i, or earlier, in Tekla Structures 2017 or newer, continue working until autosave is created, and then close the model without saving, the next time you try to open the model in the newer Tekla Structures (2017->) version and take the autosave in use, the model opening fails. The error is caused by opening the static ID model that has runtime id autosave. To open the model correctly, check whether TeklaStructures.log contains the "Table read operation failed with error code -125" error message. If it does, set XS_FORCE_RUNTIME_IDS to TRUE in teklastructures.ini. Open the model and save it normally. When you have saved the model, remove XS_FORCE_RUNTIME_IDS from teklastructures.ini. You can now define the position depth of spiral beams using the At depth option. error during database conversion if you tried to open an old model that had broken welds in it. This has now been fixed and the models can be opened again. is now considerably faster than before. installer has now been fixed. caused the attached part to appear in a view which was limited not to show that part. This is now prevented. , for ignoring crossbar location when numbering rebar meshes. The message about successfully cleared part and assembly numbers is now shown as in Tekla Structures version 21.1. Previously, when you selected a command in the Keyboard shortcuts dialog box and used the keyboard down arrow to go to the last command in the displayed list, Tekla Structures crashed. This has now been fixed. search for toolbars now only shows the toolbar commands that you can run from Quick Launch.